Some good - some bad - What is your motive for following Jesus? I would like to think that my motive was all about love, obedience and gratefulness! We were reading in Phillipians yesterday about how Paul was concerned that some of the "followers" motives were all about self - they wanted what Paul had - and even though they were preaching and talking about Christ in the correct and right way - their motives were wrong! It certainly made me think! - Motives can make us do some strange things - sometimes to the betterment of others sometimes not. God knows our motives - He understands why we do the things we do - He also knows the very depths of our hearts and the place that He holds there! God has said through His Word that He wants, actually demands, to be No 1 in our lives and if He is not then we had better re-think where we stand with Him. Our motives can dictate to us how we react, what we say and where we go. In Matthew 5:20 Jesus says that we must have "righteousness" exceeding that of the scribes and Pharisees and if we don't we will in no way enter heaven. WOOO pretty strong words there but Jesus was not one to mince words - He never did pussyfoot around with what He said. Jesus was saying quite plainly that if we are going to be His disciples we must be 'spot-on' with not only our actions but also our motives which drive those actions! Our very motives must be so pure that when under the microscope of the eternal light of God He will find nothing about which to rebuke us. Now, I hear you say, "Who can stand having the eternal light of God shining on them and finding all their motives, actions and thoughts pure"? No-one, only the very Son of God - Jesus Christ. Jesus' amazing claims that because of His beautiful/terrible sacrifice on Calvary He and He alone can place inside of us His very own nature. The very "purity" which God demands would be impossible without accepting what Jesus did for us on that day - Only by accepting His perfect gift can we be 're-made' as it were so that when God looks at us in our sinful state - He actually sees Jesus! That way even though our humanity per se does not change - He changes our heritage - our parentage - and our very nature and in so doing changes our motives as well. How are your motives? - Good deeds/actions are not enough on their own. 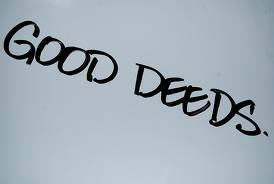 Wonderful things good deeds! - without them this sad old world would be in an even worse state than it is now - And good deeds are a product of a changed life in Christ and indeed marks that person as being one with Him. That is of course if that person's motives are right and pure - that their hearts have actually been changed and their lives controlled by the Holy Spirit. One question we should ask ourselves in all of this:- Will what I am about to do or where I am about to go, glorify God and bless others? If the Holy Spirit is guiding you then you will know straight away what you should do. If not, then the answer must be unfortunately that what you are doing is only self-satisfying and will not bring lasting happiness to you or glory to God. Think about our motives in everything we do this week - where we go - what we watch - who we spend time with and our conversations. A Spirit filled life is a fulfilled life - a self-satisfying life is temporary happiness at best.